What are the Most Common Car Accident Injuries? | Machi & Assoc. The aftermath of a car wreck is stressful and frightening. Your car will likely sustain damage, but even worse, you and any passengers will likely suffer from injuries. If you get into a car accident caused by someone else’s negligent, reckless, or erratic behavior, never just assume that you’re fine. 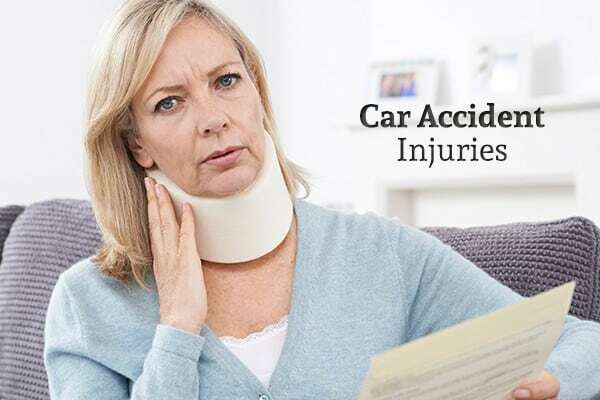 There are many injuries that may not be immediately apparent following a car accident, and even minor injuries require treatment. Treatment for these injuries wracks up medical bills, which you deserve to be compensated for. Injuries to your neck and back can be very dangerous. They’re often caused by damage to your spine, which can cause anything from minor pain to complete paralysis. You may end up in pain and even unable to work for the rest of your life if you sustain an injury to your neck or back. The term “soft tissue” refers to many different elements of your body, including muscles, ligaments, tendons, and nerves. Soft tissue can be found all throughout your body – including in your brain – and it is very often damaged during car wrecks. You’ll often get these kinds of injuries when your neck or back get impacted – whiplash, in fact, is a soft tissue injury. Nerve damage is almost always associated with spinal injuries. Of course, soft tissue damage can occur elsewhere throughout your body. Joints are common locations for soft tissue damage, but your whole body should be checked for this kind of injury. Scrapes and cuts are the most common injuries after a car accident. They’re often minor injuries that just require a small amount of treatment, but a deep cut may lead to blood loss and require stitches. One of the most dangerous auto accident injuries is a traumatic brain injury (TBI). Since your brain is the most important organ in your body, it’s imperative that you seek treatment for a TBI immediately. Unfortunately, many people don’t realize that they’re injured after a car accident since many symptoms of a TBI don’t appear right away. Because of this, they may not seek medical treatment directly following a car accident. You’re likely to notice if a bone is broken or fractured – although in some cases, it’s not apparent right away. The great impact of a car crash can often cause a bone injury. Broken and fractured bones need to be treated right away, especially if it’s a complete break. If not, you risk the bone not setting right or bits of fractured bone injuring you internally. If your car catches on fire after a car accident, it’s possible that you’ll get burned. Of course, this isn’t the only way that you may get burned; hot surfaces in your car, hot fluids leaking out of your car, chemicals, and even your airbag all have the potential to burn you. If you get burned badly enough, you may require skin grafts, which leads to thousands of dollars in medical bills. Even minor burns, though, may end up causing you problems down the line, so it’s important to get these addressed as well. Internal bleeding is the most commonly overlooked injury after an auto accident. Symptoms of internal injuries often don’t show up right away, so you may not realize that you’ve sustained one until you’re in critical condition. The late onset of internal bleeding symptoms is another reason that you should get checked out by a doctor immediately following a car wreck. If you’ve been injured in a car accident, you deserve to be compensated for your medical bills. To make sure that you get the full compensation for both your injuries and car damage, contact Machi & Associates.